Often, we only think of fire safety when we’re in the comfort of our own home—however, we spend the majority of our week at the office. Although your employer will have made sure to it that you and your coworkers are aware of the fire codes and regulations of the building, there are a few other cautionary steps you can take to prevent a fire in the workplace. Every workplace must have a fire extinguisher. Just because there is a fire extinguisher on site, however, doesn’t mean it is automatically protecting you from a fire hazard— you must ensure the fire extinguisher is working. Check on the safety device every so often to see if it’s fully charged and well maintained. A workplace should have a fire emergency plan that is tried and tested. At least annually, an employer should hold a fire drill, and have every employee learn the emergency exits of the building. That way, every employee will be ready to take action if a fire were to occur. A common occurrence with workplace fires is that they happen once everyone’s left for the day because an electrical appliance was left on, overheated, and sparked. This fire hazard can easily be monitored. Check your appliances regularly to ensure that they’re working safely, and specific devices are unplugged. Last but not least, declutter! 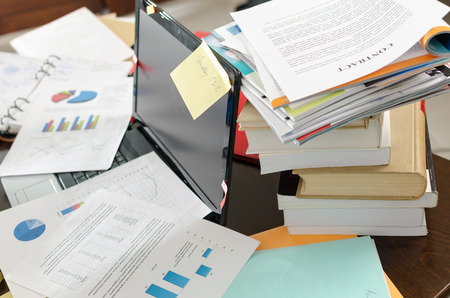 Piles of documents, folders, and clutter in general are fire hazards. If left unattended and in the wrong location, it could cause a spark or block needed ventilation. Whether you’re at home or at the office, knowing these fire prevention tips can prove essential to your safety. At Fire Tech Residential Sprinklers, our priority is your safety. Fire Tech specializes in one of the most effective fire prevention tools: a residential fire sprinkler. Contact us to receive a free estimate today! ← What Sets Off a Home Fire Sprinkler?